How Torontonians marked the end of Europe's Second World War. <b>Advertisement, <i>Toronto Star</i>, May 7, 1945. </b><br><br /> Many downtown stores closed within minutes of the official announcement. Once lingering customers departed, large retailers like Eaton’s wouldn’t reopen for two days. Some retailers barricaded their windows or removed valuables from window displays in case looting broke out. Movie theatres undertook similar precautions; at Shea’s Hippodrome (now the southeast corner of Nathan Phillips Square), staff remove lounge furniture and covered up the organ. Most theatres decided not to run newsreels depicting Nazi atrocities , though a few lower-grade cinemas ran sensationalistic fare about recently deceased Nazis. 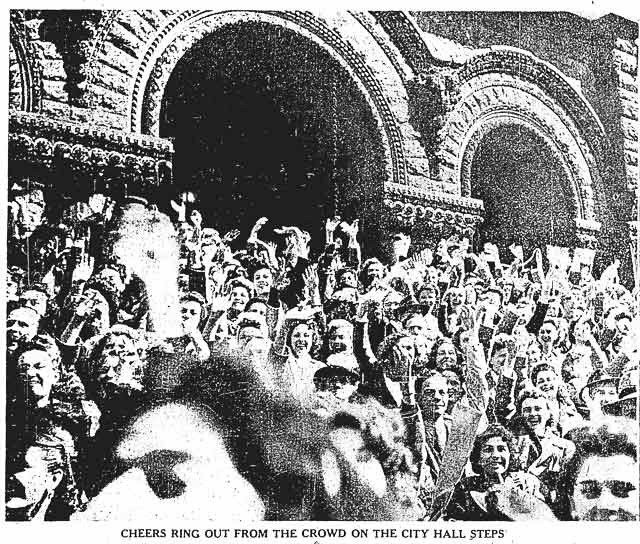 <b><i>Toronto Star</i>, May 7, 1945.</b><br><br /> City Hall was a popular gathering spot. Elsewhere downtown, four army and RCAF sound trucks were swarmed by revellers at King and Yonge. As promised, leaflets were dropped by Mosquito planes, but mingled with piles of ticker tape tossed from office buildings. At Queen’s Park, an effigy of Adolf Hitler made by employees of the provincial Department of Labour was hauled out, tied to a stake, and burned amid cheers from other civil servants. The morning headline of the Globe and Mail on Monday, May 7, 1945, reflected the sense of anticipation sweeping across Toronto: “WAR END MATTER OF HOURS.” Within an hour of the German surrender at 8:41 p.m. Eastern Time the night before, the first baby born at St. Michael’s Hospital was named after the feeling in the air: Victor. When the official end of hostilities in Europe was announced at 9:36 a.m. on May 7, Torontonians spilled out into the city’s streets. After six years of fighting, it was time to party and reflect on those who wouldn’t be joining the celebrations. Enter the gallery for images and stories of how VE Day unfolded in our city. Additional material from The Day the War Ended by Martin Gilbert (London: HarperCollins, 1995); Days of Victory by Ted Barris (Toronto: Thomas Allen Publishers, 2005); the May 7, 1945, May 8, 1945, and May 9, 1945 editions of the Globe and Mail; the May 7, 1945 and May 9, 1945 editions of the Toronto Star; and the May 7, 1945 and May 9, 1945 editions of the Telegram.